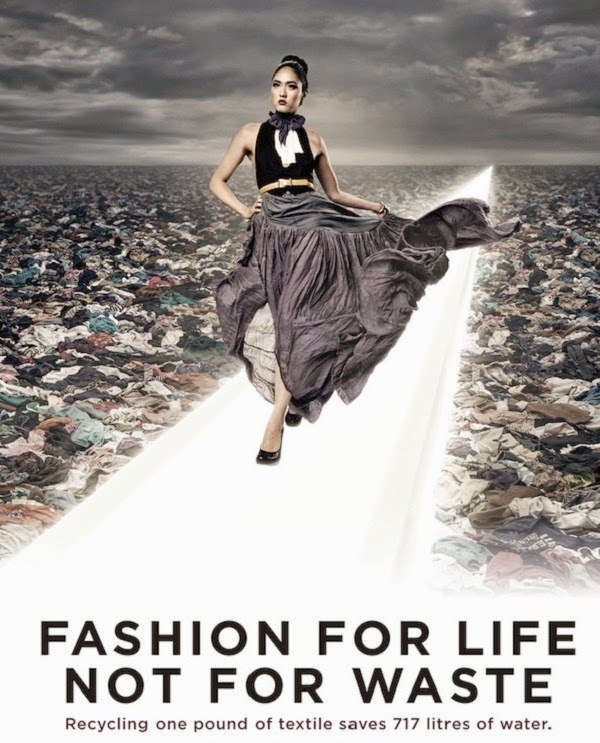 Every season of Eco Fashion Week I say the same thing - the Value Village shows are always my favourite as they embrace the Eco Fashion, Zero Waste and Up-Cycling Movements. I love the way those participating have to push their creative envelope to help us all see the fashionable possibilities of used garments. In the Thrift Chic Styling Challenge, three stylists are given a set budget of $500 and challenged to style a ten look runway collection using only clothing and accessories purchased from Value Village stores. They can shop at one store or in several. The process can involve just a single trip if they are lucky, or require multiple visits over the weeks allotted. Shoes I would assume would be a particularly daunting challenge. Over the four seasons I have attended this show, the range has been from very wearable to totally out of the box funky. Last night we were treated to three very diverse collections as you can see from the images below. Lucy Yun offered us young, relaxed and casual, Megan-Magdalena Bourne brought a little more upscale with a rock and roll edge and Dominque Hanke showcased colour and bold looks complimented with great hair styling. Instead of writing up each stylist, I decided to offer you short Q and A's with each of them along with a selection of runway pictures. ENJOY! I was born and raised in Changwon, South Korea. I moved to Seoul to study in university and work. After completing 2 years of a Journalism/Communications degree in school, I wanted to go abroad and experience more. So I went backpacking to Europe, studied in Melbourne, Australia for a month and then Vancouver, Canada for a year to study English, Sales and Marketing. I fell in love with Vancouver right away, so I decided to move here for good. I have always been fascinated by fashion because of the fun, artistic, creative and visual parts of it. I still vividly remember hiding my mom’s black high-heels and wore them under the desk while I was studying in grade 5. Talk about your journey as a fashion stylist. 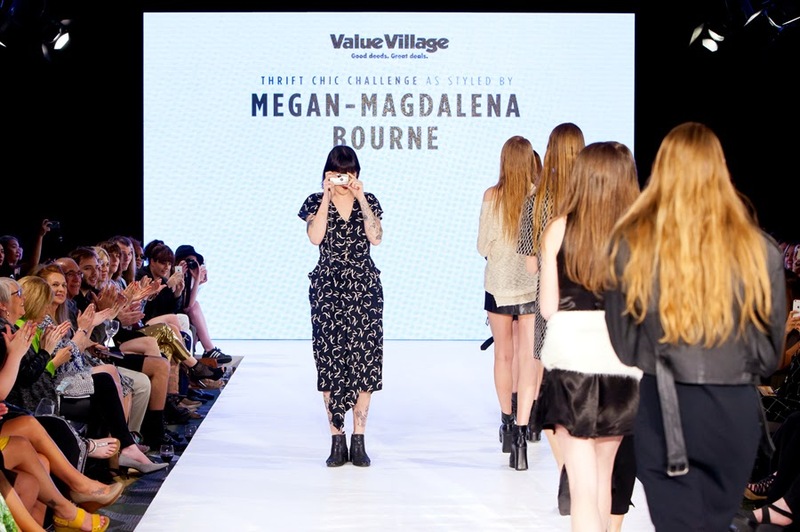 How did you become involved in EFW's Value Village Thrift Chic Challenge? Back in February 2015, I styled a portrait photo shoot of me with a very talented photographer. We developed a concept that is Victorian-era, vintage, dark and moody. I found a pop-up store in Gastown, Closet Crows, who loaned the garments for the shoot, some of them were owned by Myriam, the founder of Eco Fashion Week. Later on, Myriam asked me to participate on Thrift Chic Challenge, so I agreed to do it. Shopping within the set budget to get all you need must be a real challenge. Talk about your process - how often did you shop, how many stores did you visit, did you have a theme going it or did it develop as you were drawn to specific garments? I already had my concept set-in-stone before starting to shop, thus, finding garments and accessories that fit with the theme was not too difficult. I actually spent all of the budget on my first day of shopping, then tweaked a little bit after fitting. So far, I have been to Hastings location three times and Victoria Dr. location once to complete my collection. 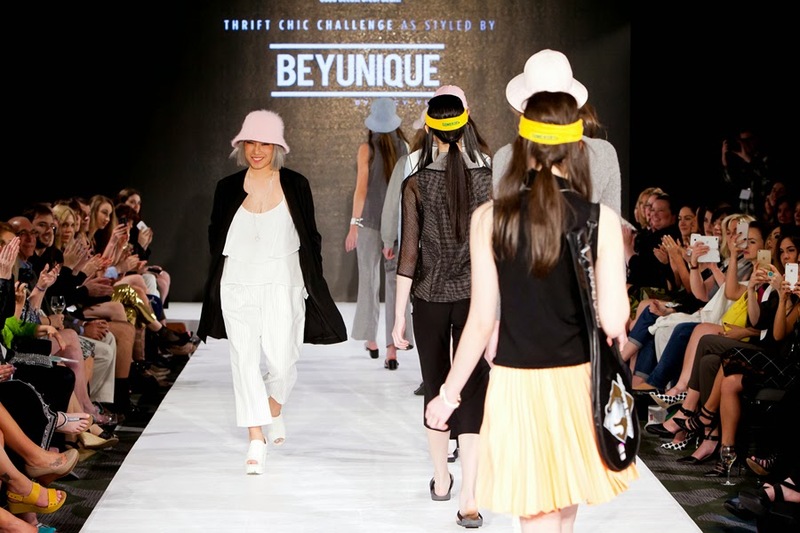 Can you share your final thoughts about the collection we saw on the runway? To have fun and make as little mistakes as possible. What did you gain from this experience and what advice do you have for stylists hoping to be a part in future Thrift Chic Challenges? In my opinion, knowing your style, having the concept ready, managing your time and resources are the keys to the successful collection. Having the ability to calculate and do the math is also important because of the tight budget. I would suggest to set the limit of prices per look before buying. It’s all about finding and putting clothes, shoes and accessories together that fit your style and the budget. Vancouver, baby! Spent time on the island, in the suburbs, and on the road. Yes! I grew up in the 90s, so the Spice Girls were a huge thing for a lil lady like myself. Dressing up to go to their concerts was probably the first time I was conscious of fashion. I've never desired to be a stylist. As a broke photographer, it was just something I had to do because I couldn't afford a stylist. I've always known what I liked and people have been receptive to it. Everything I do is an extension of my personal style, a way for me to express different sides of myself. I've always been drawn to a style that is timeless and functional… with a lil bit of rock and roll. I'm definitely a "yes" kind of girl. I've had friends do this challenge in the past, so when I got asked to do it I jumped at the opportunity. Why not? I'm all about collecting experiences. Plus, I've been shopping at Value Village, styling myself and my models, for the past 10 years or so. I live a block away from a Value Village so that made things easier. I went to 5 different locations in total. I'm not one to rush or stress about things so I just took it really easy and let it happen organically. Like I mentioned earlier, everything is an extension of me. Creating this collection was pretty much me just shopping for things I would love to wear if I was a model. hahaha. It's pretty much the dream wardrobe that I'll never be able to fit into. It was very me! haha! Fashion has always been a huge part of my life. I vividly remember pulling apart my mother's closet to try on all her beautiful pieces and drawing lavish gown and hat designs in my bedroom for hours on end. Style and styling have always been a huge interest but it was only when I started my millinery business back in 2011 that it became a part of my work life. Putting together photoshoots and runway shows for my business gave me a real taste for it. I started getting people asking me to style them and eventually a photographer and makeup artist (the awesome Mr Johnny Se and Ms Sara Vande Vyver) asked me if I would style a shoot for them. I was super flattered, but I was like "Sure, but just so you know I am not a stylist". The shoot went well and from there it just grew, and now I work with multiple magazines, photographers, brands and celebrities. I shopped at four different stores, and the Hastings one I visited probably half a dozen times. The budget is a challenge for sure, but if you shop smart it is more than doable. $50 per look can stretch pretty far if you are selective. On my first visit I built up my theme. My inspiration is the fun of fashion. I was inspired by my youth and my first forays into developing and defining my style (the late 90's early 00's pop culture), and the inspiration I draw from the amazing Advanced Style ladies and their ability to create and play with style in such a fearless way. You will definitely see visual references to films such as 'Clueless' and 'Mean Girls'. I hope it was fun. I hope it pushed people's ideas of what is available to them at thrift stores, as well as what they can wear in their own lives. As someone who loves fashion and the artistry of fashion design, I want people to enjoy their wardrobe. Our wardrobe choices are the way we get to define ourselves. They tell the world who we are without us having to say anything, and we all make that choice. Even those who "don't care about fashion" make a choice. Why not make an enjoyable one? This is such a unique event. I hope any future stylists have as much fun as I did. It really gives us a chance to show a different angle and face of the industry. If I could give any advice it is to just keep a clear head and stick with the plan, as there are so many options and it can get a little overwhelming, but mostly have fun!